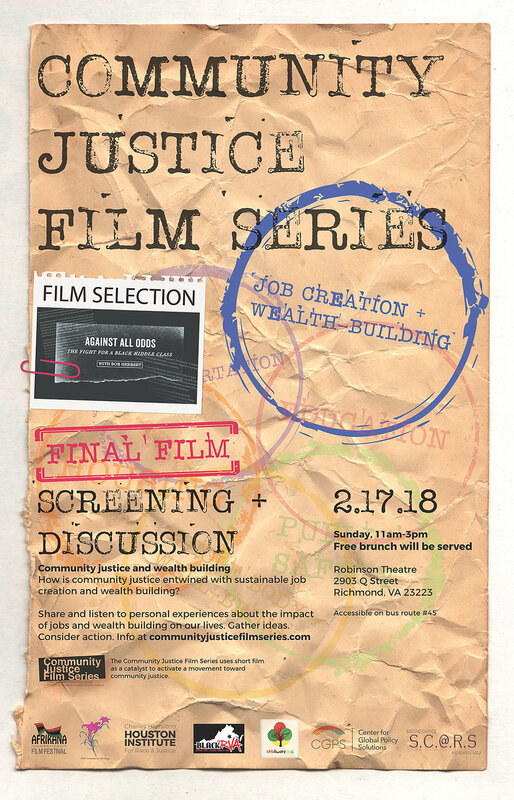 In February 2018, the Community Justice Film Series presented the final film in the 18-month process taking a deeper look into the ways that job creation and wealth building are integral to #CommunityJustice. Reduced educational opportunities, rampant employment discrimination, mortgage redlining, and virulent housing segregation are all explored in this film as actions that contribute to less attainable prosperity among black families over generations. Learn more about this issue by reading the op-ed published in the Richmond Times-Dispatch by film series partners. Approximately 80 people joined together to watch "Against All Odds" and discuss what it means for #CommunityJustice to be infused in the ways we build wealth in this country. Have African Americans had a fair shot at the American dream? That’s the question acclaimed journalist Bob Herbert asks in the new documentary “AGAINST ALL ODDS: The Fight for a Black Middle Class." In it he examines the often heroic efforts of black families to reach the middle-class in the face of unrelenting barriers. Watch the full video on PBS at http://www.pbs.org/video/chasing-dream-against-all-odds-full-film/.